All thought of her flies to those sparse hills and moors of the North. Who can forget the scene where Jane Eyre, ousted from Paradise by a mad wife in Thornfield’s capacious attic, lies down on the moor, to die? But fate has many years of prosperity and happiness in store for Jane. She cheats death and grasps life as only a Bronte heroine can.All the more unsettling, then, to discover her grave. 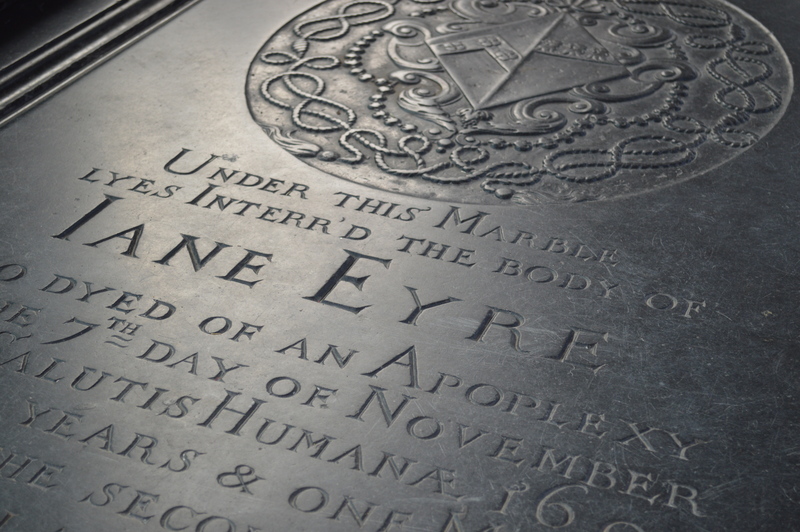 In an entirely un-Northern, counter-rugged location.For I found Jane Eyre buried in Salisbury. It is never difficult to find the cathedral in a cathedral town. You park, you look up, you follow the spire. And I was doing just that when I came upon a little church: the rather lovely mediaeval church of Thomas Beckett. Step inside and feast upon the spectacular wall paintings, the exquisite wooden tracery. It is a jewel among churches: and as I carefully read each notice and label, I came upon references to Jane Eyre’s tomb. Really? I thought. Can it be, so far from Thornfield and home? The church was used to enquiries, and Jane’s black slate stone is kept beneath a protective rug, away from the footfalls of tens of thousands of inquisitive literary tourists. This Jane Eyre was Eyre by marriage: she wedded Nicholas Eyre,and they had three sons and two daughters. She lived to a ripe old age: almost 70; and she died in 1695. But so far away from the Bronte parsonage. Is this a coincidence, do you think? Or did Mrs Eyre’s history reach the ears of an aspiring writer 130 years later? Time, I suspect, will never tell. Posted in Literary livesTagged anglophile, Charlotte Bronte, england, history, Jane Eyre, literature, Salisbury, Thomas Becket ChurchBookmark the permalink. Well spotted! 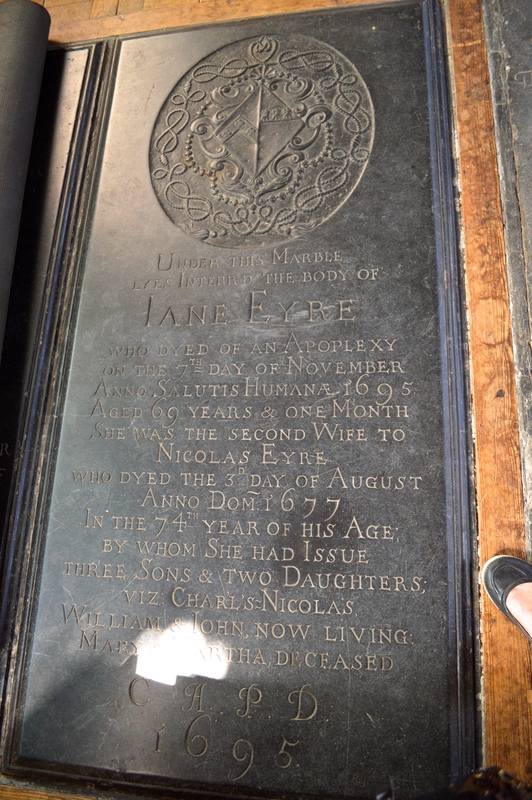 It’s like the memorial to Elizabeth Benet in Bath Abbey: one would like to know how many other literary namesakes are commemorated in churches and cemeteries! Sounds like a new kind of collection to me, Chris. Like cigarette cards. Now we have two: Elizabeth Bennet and Jane Eyre. Who next, I wonder? Hmm, so many stories have been forgotten, especially of women. So hopeful to think some written were actually tributes of a sort, even if partially imagined. I’ve always loved Jane Eyre. She was such a comfort to me as a teen. Ah, but we wonder, don’t we? One could go quite doolally with curiosity, Penny. I have to make myself stop thinking about it or I could do just that. Here’s how out of touch with reality an avid reader can be: when I saw the title of your post, and the pic of the gravestone, I thought “Cool! Kate’s found Jane Eyre’s grave.” I didn’t remember, until I began reading, that Jane is fictional! Instant shiver (and a bit of readjustment of my brain). I felt just the same when I was there, Elizabeth: a proprietorial certainty that Mr Rochester’s Jane ended her life sleeping next to him in a beautiful English church. I think I might choose to believe it anyway. What? Jane Eyre is fictional? Where did you hear that? That crazy Bertha Rochester has been spreading rumors again. Mad as a box of frogs, that one, Gale, mark my words. Thanks for the great pix – and the delightful tale. Nice that little rug. My pleasure 🙂 The carpet stops us all ruining Jane’s tomb: practical, and it hides the tomb from view unless you actually ask to see it. You could walk straight past and never know it was under the rug. I had to do the same thought adjustment: Oh! Jane Eyre’s grave! Wait, what? Oh my goodness, hello. Fiction vs. reality. I loved Salisbury when I was there, Kate, although I never went to the cathedral. This Jane Eyre would have walked those streets, or others like them, back in 1642. My mind still takes me there, after all this time! That conviction must be born of something, Tom. And the fact that year haunts you a little, means that you have to play the water-diviner, only with time: follow the clues, sometimes down blind alleys, and listen to your unconscious very carefully indeed. I hope you find your 1642, one day. My money’s on this being the real Jane…….Awesome! !